It was a strange way by which I was guided into the Faith. I was born in Kuantan, Pahang to a somewhat middle-class family. We were a happy family until my father’s sudden death in August 1956, caused by accident, robbed us of all comfort and happiness. I was only 8 years old when that happened. From then onwards it was nothing but hardship and and uphill struggle for our family members-comprising three sisters and two brothers, along with my mother. Despite all the struggles, my mother managed to take care of us, by giving us whatever education she could afford. I managed to obtain a Diploma in Handicraft-my field of interest. I grew up in a very liberal atmosphere as a Hindu and had great respect for all the religions I came across. My marriage to G.K. Balan at the age 25 was a proposed one, and it was through my husband that I first heard of the Baha’i Faith. But it was through my husband’s younger brother, now Professor Dr. Ananthan Krishnan that I got the true essence of the Faith. This was sometime in 1972 that I accepted the Faith. My meeting with my husband and receiving the message of Baha’u’llah clearly reminds me of a dream I had where I happened to come across a statue resembling that of the Buddha in a friend’s home. When I inquired about the statue, my friend told me that it is Vishnu Yasha- the promised one according to Hindu belief. But I knew not many Hindus kept the statue of Vishnu Yasha in their homes. When I looked at the statue, its eyes seemed to become alive, and seemed to beckon me to ask for a wish. Could it be an imagination? I hesitated for a moment, and slowly asked the statue to bestow upon me a good husband. This dream remained a puzzle to me until I met G.K. Balan, and heard of Baha’u’llah and His Revelation through him. In the Holy Texts of the Hindu religion it is prophesied that a Lord Krishna will return under the name of Vishnu Yasha, which, when translated in English means “Glory of God”. I soon realized that this dream of mine was actually fulfilled through this marriage, as it was through G.K. Balan that I was guided into recognizing Baha’u’llah as the Manifestation of God for this age.It did not take me long before I was fully convinced that Vishnu Yasha had returned in the name of Baha’u’llah, both names bearing the meaning of Glory of God. Soon after accepting the Faith in 1971, I wanted to go out to meet my friends and share with them the Message of Baha’u’llah. I could not do it right away, because of the imminent marriage plans. After becoming a Bahai, I came to understand the importance of having a Baha’i marriage. Since both of us were Bahais there had to be only one wedding and that too a Bahai wedding. Both parents agreed to our wedding, but a written letter had to be obtained from Balan’s side. The parents on both sides must have expected us to have Hindu weddings as well. But the whole plan was now changed. This sudden change of plans turned my marriage into a slight crisis. As soon as both our families came to know that we were planning for a full Baha’i marriage,severe opposition arose, especially from my husband’s side. Our wedding took place in Kuantan on 7 April, 1973, under the auspices of the Local Spiritual Assembly of Kuantan. Ananthan Krishnan was the able Master of Ceremony. No one except for a handful of relatives supported our plans. All those who opposed the Bahai marriage did not attend our wedding.It was our Baha’i friends who stepped in and took over all the initiative to organize the Baha’i wedding, and they did a good job. 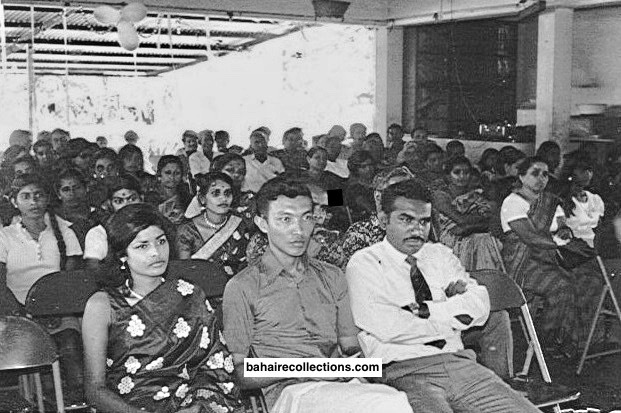 It was a simple wedding where members of the Baha’i community came from as far as Penang, including the late Captain Choo Yoke Boon.Some of the others who attended our wedding were Danapal, the Times reporter, Puspa Tina, Major Munusamy and his wife Theresa, Visvanathan and Rajmohan. Raymond Peter who was pioneering in Sri Lanka at this time had returned to Malaysia also came for my wedding. My wedding, graced by the late Choo Yoke Boon and Raymond Peter. The wedding went all well, and it did give good publicity for the Cause. But not all was over. More dramas unfolded. After the wedding we had to go back to the home of the parents of my husband out of respect, and following Indian tradition. As we entered his home, no one greeted us. To my utter shock and surprise, I was not even given a place to sleep. With no choice left I had to sleep on the bare floor. Only one or two members of the family spoke to us that night. It was truly a miserable night for my husband and me. We managed to rough it out that night and returned to our home in Jerantut the following morning.Since the wedding day I did not have any kind of communication or relationship with my husband’s family for over five years. Although the family members were cold towards us, we found happiness and comfort in the company of our true family- the Bahais who came and supported our wedding and remained with us in all situations. My parents in law later were compelled to come and stay with us in Jerantut, after 5 years of our wedding. My brother in law whom they were staying with had to go overseas and at that point of time there was nobody to take care of them. They reluctantly came and stayed with us for one year. After a while I could change their mindset a little, by exposing them to the Faith and having activities in our home. While in Jerantut, with the support and assistance coming from my husband,it was simply an onward march for me towards my spiritual development and service to the Cause. Without even realizing it,my life slowly started to be patterned along the Baha’i way of life. I was setting aside much time for all Baha’i activities at community level, and alsoarranged gatherings and activities outside the community. It was during this time that I attended the South East Asia Regional conference in Port Dickson in December 1976. There I had the gift of meeting three Hands of the Cause of God, namely Mr. Collis Featherstone, Mr. A. Q. Faizi and Dr. Muhajir. The talks by the three Hands of the Cause moved me to completely another world. They gave so much new knowledge and instilled so much spirit in the crowd that the environment changed completely. All the Bahais seemed to be in a totally different world. The talk on the topic of “Blood of the Martyrs” by Dr. Muhajir touched me very much. He requested all the Bahais gathered at the conference to put our fingers on our wrists to see if we could feel our own pulse. When we said “yes, we could feel the pulse” Dr. Muhajir said that it was actually the blood of the martyrs that was pumping onthe inside every Baha’i.he further said that we Bahais are truly the result of the sacrifice made by early believers who laid their lives for the Cause.It is from the blood shed by those heroes that we have sprung out. I have never even though of that. I was shaken and moved to the core of my soul as Dr. Muhajir gave this analogy. I realized that as Bahais we are all spiritually connected in some way with the early heroes, not forgetting the current living Bahais as well. It dawned upon me that it is the spiritual life that is more important than the physical one. The talk by Dr. Muhajir came as a spark into my soul. I had read Bahai books to gain the Bahai spirit. But the talk by Dr. Muhajir was more inspiring that what I had read in the books. He was able to penetrate one’s very soul! Until I attended this conference I did not get to know the station of the Hands of the Cause of God. It was after this conference that I sat down to read and discuss with other Bahai friends the important role the Hands of the Cause of God had played in the Faith. I felt very happy and lucky to have met them in person and thanked Bahaullah for this special privilege. This conference truly lifted my spirit. When I came back I was eager to know more about the station of the Hands of the Cause of God. It was then that I came across this passage from the Master in His Will and Testament. “The obligations of the Hands of the Cause of God are to diffuse the Divine Fragrances, to edify the souls of men, to promote learning, to improve the character of all men and to be, at all times and under all conditions, sanctified and detached from earthly things. They must manifest the fear of God by their conduct, their manners, their deeds and their words. These Hands certainly had so much influence on the Bahais, at least in my own life. I understood that following the passing of the Guardian, the appointment of the Hands of the Cause ceased, and there is certainly a great wisdom in that. Following the conference, my husband and I consulted how we could serve the Cause effectively. We decided to do the best for the Faith, within our capacity, wherever we resided. With our Baha’I spirit high, we stepped up our Bahai activities first in this small town of Jerantut. It was from the lessons learnt from thatConference that we decided to dedicate ourselves for the Cause. With the help many constant and regular travel teachers we managed to lift up the banner of Baha’u’llah not only in Jerantut but in many nearby estates and towns such as Kuala Lipis, Benta, Raub and Bentong. My husband and me wereteaching the Faith most of the time, as we wanted to build a strong community with Nineteen Day Feasts,deepening classes and children classes going on regularly. The first Local Spiritual Assembly of Jerantut was formed around this time. As a Technical Assistant with the Public Works Department, my husband was transferred from place to place. All went well in Jerantut until my husband got transferred to Kuala Lipis in 1980. While in Kuala Lipis we managed to teach the Faith, and form an in 1981. The late Mr. Francis Singam kept our spirits high with his regular visits. In Kuala Lipis we had regular firesides,deepening classes and children classes. We also made regular extension teaching trips to neighboring estates like Benta Estate,Tuan Estate, Bentong Estate and Budu Estate as well as nearby towns like Benta, Raub, Bilut Valley, Bentong, Karak, Mentakab and Temerloh. It was indeed a very vast area that we had to cover. We got involved in the State Teaching Committee and contributed towards implementation of its plans for the development of our beloved Faith. From Kuala Lipis we moved over to Kuantan in 1985. We were in Kuantan from 1985 to 1998. There was a fairly strong community in Kuantan at that time where teaching activities, deepening classes, youth classes and children classes were held on a regular basis. We joined in the extension teaching trips to the neighboring towns of Pekan, Kemaman and Maran. In Kuantan we opened our home for all activities.Just as the South East Asia Regional Conference in 1976 provided the much needed spirit, the Second Bahai World Congress held in New York in 1992 also gave us another boost to our spirit. We attended this Congress as a family. From Kuantan we moved over to Kepong in Kuala Lumpur community for about a year in 1998 before moving over to Ipoh in 1999. While in Ipoh we got involved in teaching, deepening, youth and children class and extension teaching and deepening activities to the nearby towns of Sungei Siput, Kampar and Parit. We were part of the Menglembu community. We managed to complete the Ruhi lessons until book 7 and almost immediately started tutoring Ruhi Book 1 to Book 7 in the English, Bahasa Malaysia and Tamil. It was while in Ipoh that we started our Bahai jewelry business. We displayed and promoted the Baha’i jewelry in all major gatherings. We left Ipoh and went back to Kuantan sometime in 2006. We continued to assist the Kuantan community in all the core activities and within a short period of fewer than two years, we reached the IPG level. Children classes of the various age groups, youth classes, Ruhi lessons and teaching trips were organized on a regular basis. While Kuantan was actively involved with all the core activities, we left for Kuala Lumpur in 2010. Due to my deteriorating health, I could not move very much in Kuala Lumpur. We managed to conduct a couple of Ruhi classes in our Puchong neighborhood. Now I have resorted to teaching the Faith through my own blog “The Shining Lamp” in the Facebook. The response is overwhelming and I am happy that I can continue to be in touch with the Faith and of service to friends all over the world.